‘Chicken tikka masala is a true British national dish,’ declared then foreign secretary Robin Cook in April 2001. However, restaurateur Enam Ali MBE, founder of the British Curry Awards, vividly recalls when curry was met with scepticism and suspicion on Britain’s high streets, 30 years ago. 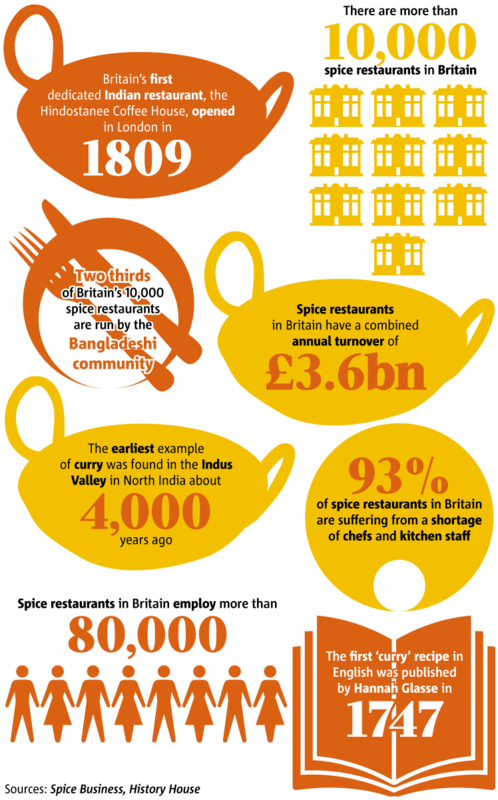 Today, curry houses – or ‘spice restaurants’ as they’re known in the trade – serving Indian, Pakistani, Bangladeshi, Nepali and Sri Lankan-inspired food are part of the fabric of modern Britain. They make up a thriving industry with more than 10,000 restaurants and takeaways employing 80,000 people and turning over £3.6bn annually. Tonight’s ninth British Curry Awards, or ‘Curry Oscars’ as prime minister David Cameron describes them, held in Battersea, London, is an opportunity to mark the contribution of the humble curry house and its owners, waiters and chefs, past and present. ‘I started the awards to salute the hard work of the first generation who opened restaurants in the 1960s, 1970s and 1980s and had to deal with racist insults – they had no celebrity chefs or mentors to guide them and they put in so much,’ said Ali, who founded the award-winning Le Raj restaurant 24 years ago and has worked in the industry for more than 35 years. Bob Walton OBE, chairman of the Restaurant Association, feels curry houses have been integral in the transformation of Britain’s food culture. ‘Thirty years ago, Indian and Chinese restaurants brought the British out of their homes to eat,’ he said. ‘As a result, dining out wasn’t only for an occasion but something you could do midweek because it was affordable, and that’s one of the big reasons the culture of food has changed so dramatically in Britain in the last 20 years. However, the curry industry is facing a variety of challenges, such as stiff competition thanks to the rising popularity of street food, pop-up restaurants, dinner clubs and food markets. The industry’s biggest challenge is overcoming a shortage of skilled chefs, as a result of strict immigration rules. ‘Since the introduction of a points based visa system in 2005, restaurants have been unable to recruit talented, experienced chefs from India, Pakistan and Bangladesh and more than 100 restaurants have closed because of this – we are suffering,’ said Ali. ‘The chef is the key man, you can spend £1m on designing a fabulous restaurant but without a good chef it won’t work. Restaurants have not been able to expand and open more branches because we can’t find British and European people to train as spice chefs – it’s a serious profession that requires cultural knowledge.